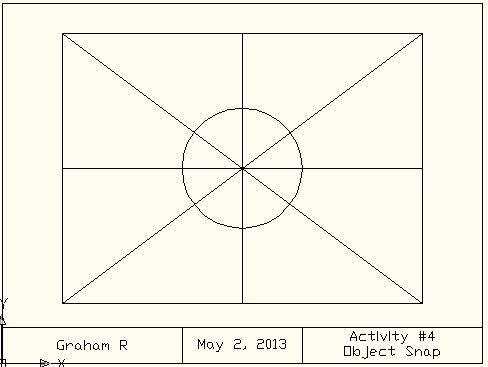 then open Activity #1 and choose "Save as..."
and save the file as "Activity-4.dwg"
- Turn on "Object Snap"
"Object Snap" is the ability to draw shapes by 'snapping' to various parts of another object. 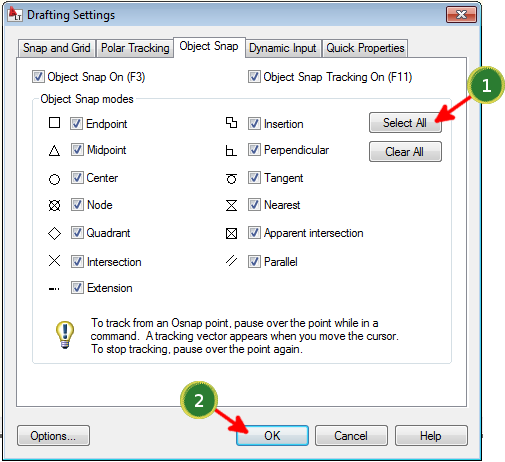 By default, AutoCAD only has a few "Object Snaps" turned on. The "Drafting Settings" window should now appear, and the "Object Snap" tab will already be selected. Click the "Select All" button. Make sure that your OBJECT SNAP selections all have check marks. All other lines are made using the "Line" button and using the snap commands. The last step is to draw a circle. Select the Circle Tool and make sure "Snap to Intersection" is checked. Snap where the centerlines intersect and click once. Type in "10" for the radius of the circle. Save this drawing as "Activity-4.dwg".